Victory is sweet: Champion Craig Hinton (c). Craig Hinton survived a compelling late fight-back from compatriot Scott Campbell to seal a tense victory at the Ascorp Golf Citizen Abu Dhabi Open at Yas Links, on Wednesday. The 27-year-old Englishman closed with a 69 to reach 13-under for the tournament, edging Campbell by one-shot for his second win on the MENA Golf Tour. England’s Lee Corfield, playing in the final group alongside Hinton, occupied solo third after carding a final round 70 as Zane Scotland and his playing partner Joe Heraty shared fourth on nine under, one ahead of Spain’s Borja Cabello. “It was a pretty enjoyable week. This golf course is just fantastic. Stuck to my game plan and didn’t miss much. 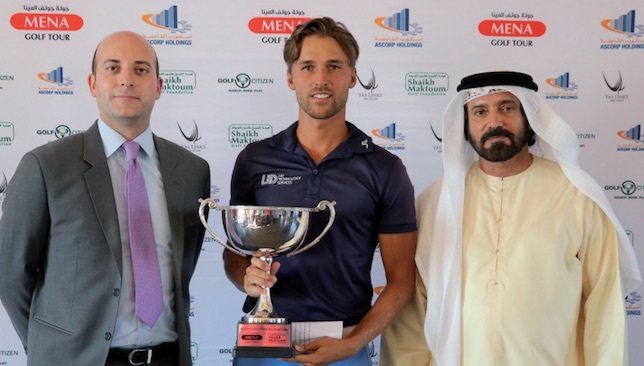 And if I did it was in the right areas and that gave me good scoring opportunities,” said Hinton, who received the winner’s trophy from Giuliano Gasparini, senior manager of hospitality and leisure for Aldar Properties, and Mohamed Juma Buamaim, chairman of the MENA Golf Tour. “I think making a birdie on the 17th was crucial as it gave me a oneshot cushion standing on the 18th tee. During the whole week, I may have missed a few putts, but holed the crucial ones which was the key,” he said. Campbell, starting the day five off the pace, made things interesting, shooting a sparkling 65 to set the clubhouse target at 12 under par. Playing in his very first event on the MENA Golf Tour, Pierre Junior Verlaar of the Netherlands wasted no time in making his presence felt, winning the leading amateur title on six-under, a good three shots ahead of Scotland’s Daniel Hendry. Morocco’s Younes El Hassani won the MENA Division for professionals on one under after carding a final round 70, beating his nearest challenger and compatriot Ahmed Marjan by one shot while Saudi Arabia’s Othman Almulla took the region’s leading amateur honours for the fourth time in a row. Saving his best for last, Almulla returned a brilliant 69 to reach level par for the tournament, finishing a good six shots ahead of Morocco’s Jamal Allali in his division. “The whole UAE swing has been great for me. Played really well, but didn’t hole that many putts,” said the 30-year-old Saudi ace, who mixed four birdies with a lone bogey at the 16th. Craig Hinton rode a strong birdie-eagle start en route to a six-under 66 that propelled him atop the leaderboard after the opening round of the MENA Golf Tour’s Ascorp Golf Citizen Abu Dhabi Open at Yas Links course on Monday. The 27-year-old Englishman from Thame made five birdies and one eagle against a long bogey to go one clear of Joe Heraty of England and Kevin Esteve of Andorra on a hot and humid day when 28 players broke par. England’s Lee Corfield, a four-time winner on the MENA Golf Tour, spearheaded the chasing pack alongside promising Dutch amateur Pierre Junior Verlaar a further shot adrift on four-under 68. “I got off to a solid start and that kind of set the tone for the round. Played really good and didn’t miss much out there,” said Hinton, who smashed his four iron from 232 yards to within 15 feet on the second and holed the eagle putt. “The course is playing is good and its design is absolutely great. There are plenty of scoring opportunities there if you can keep the ball in play,” added Hinton, who bogeyed the 18th after pulling his approach into the rough. Playing in his first season on the MENA Golf Tour, Esteve was equally pleased with his day’s efforts. “It was a pretty good day there,” said the 26-year-old. “I drove the ball and putted solid. I could have done even better, but missed two easy birdie chances and then three putted the par-3, eighth for my only bogey of the day. 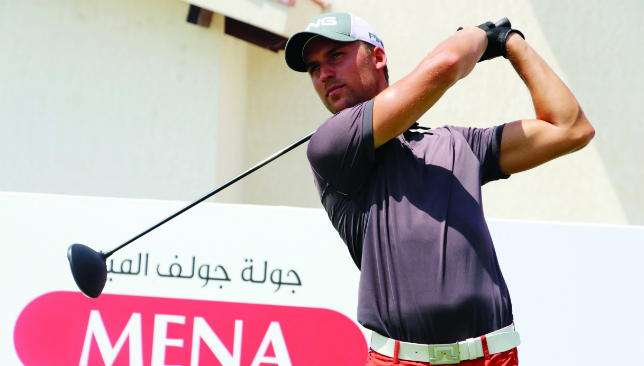 Morocco’s Younes El Hassani led the MENA Division for professionals after opening with a 71 one clear of UAE’s Ahmed Al Musharrekh as Bahrain’s Sam Hobday spearheaded the charge in the region’s amateur division after carding a par 72 despite a double bogey on the ninth. Al Musharrekh flew off the gate in style, reeling off three birdies in a row from the second before making the turn at four under. He picked up another shot on the par-5, 11th to move to five-under, but a quadruple bogey on the 12th halted his charge up the leaderboard when he pulled his drive, resulting in a lost ball. “Take that hole away, I think I really played well. I am feeling quite confident about my game, going into the second round,” said Al Musharrekh, who is seeking his first MENA Golf Tour win. Meanwhile, Welsh ace Stephen Dodd and the English duo of Zane Scotland and Danny Poulter carded matching 72s, while Andrew Marshall returned a one-under 71 and Luke Joy settled for a 73.